NYC Educator: Opt-Out Rally---Where's the UFT? 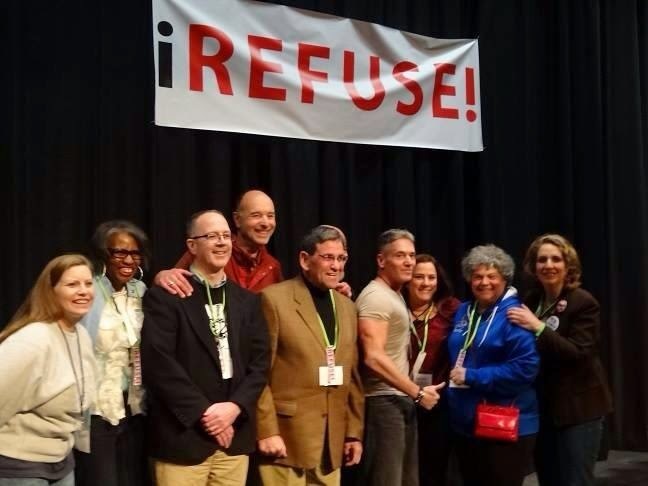 Here are some of the presenters at the opt-out forum that took place yesterday in Comsewogue. I got to meet and speak to a few of them. Second from the right is Beth Dimino, the intrepid President of the Port Jefferson Station Teachers Association. All the way to the left is Mercedes Schneider. In the center is Comsewogue Superintendent Joe Rella. GOP gubernatorial hopeful Rob Astorino was in attendance. Astorino spoke of his opposition to Common Core. He somehow forgot to mention his opposition to gay marriage or legal abortion, or his fondness for charter schools, and still mustered the audacity to accuse Cuomo of dancing around the issues. I certainly hope there is opposition to Cuomo, but I won't be casting votes for the likes of Astorino on this astral plane. Rella spoke of a tribe in which the overarching question is, "How are the children?" This, to them, reflected on the community. In our state, according to Common Core testing, 70% of our children are failing. This, of course, is an unacceptable and invalid portrait of our State's kids. Rella, when I met him, likened himself to the conductor of an orchestra. He said the teachers were his musicians, that he didn't actually know how to play their instruments, and that couldn't do his job without them. For someone accustomed to the likes of Joel Klein, talking to him was revelatory. I've read Mercedes Schneider's blog, and noticed her impeccable research. She told us she opposed Common Core standards because she had personal standards, and then called Common Core toxic for its failure to create a knowledge base. Then she told stories of how she'd give her high school kids said knowledge base via telling them stories, and it was very easy to believe. She's got a soft Louisiana accent, and I do believe I could listen raptly while she read a telephone book. But she's also ridiculously intelligent, and that's apparent to any and all who speak to her for more than one minute. Beth Dimino is rapidly becoming one of my personal heroes, as she is a woman of action. She does not let the grass grow around her feet, and when NYSUT leadership was challenged for the offense of exercising their collective conscience, she made sure to stand up and help. Not the least of this included recruiting me to run against coup leader Andy Pallotta. As UFT was entrenched in supporting those who'd bend to the will of leadership, she found and recruited members from MORE, the UFT opposition caucus, to oppose those who favored the status quo. And yet, at this event full of brilliant and moving speakers, the sole representative of the UF of T appeared to be me. No one from leadership showed up. I sat in front of NYSUT President Richard Iannuzzi, and two seats to the right of NYSUT Secretary Treasurer Lee Cutler. Two seats to my right was head Badass Teacher Mark Naison. I didn't see anyone from the so-called Revive NYSUT either, now that I think of it. ...the budget also provided a major victory for charter schools, many aspects of which the mayor has long criticized. Most significantly, the legislation would require the city to find space for charter schools inside public school buildings or pay much of the cost to house them in private space. The legislation would also prohibit the city from charging rent to charter schools, an idea Mr. de Blasio had championed as a candidate for mayor. Let's take a look at that. Mayor Bill de Blasio actually ran on the plank of charging rent to charters that could afford it, and won overwhelmingly. Yet that didn't stop Moskowitz and her BFFs from giving at least $800K to Governor Andrew Cuomo. And though they couldn't afford to pay rent, they managed to scrape up millions of dollars to air misleading commercials to drum up sympathy for corporate-backed charters. Now, it's whatever Eva wants, Eva gets. If de Blasio denies her space in your school or mine, she can simply find whatever space she sees fit and charge taxpayers rent. You see, under Andrew Cuomo, mayoral control is fine as long as it favors his well-heeled BFFs. When NYC elects a mayor who didn't buy the election with 100 million from his own pocket, all bets are off. I got the chapter leader newsletter last Friday night and it contained not one word about it. Though it was parent teacher conference day, I found the time to call several legislators and urge them not to approve the budget. Though Mulgrew spoke against it after the deal was in place, I find it hard to believe that Shelley Silver was able to approve it without at least his passive consent. UFT leadership has got a massive email bank and made no effort whatsoever to have members contact legislators. It's certainly done so in the past. There was no call to phone banks, and no significant pushback, if indeed any, to the Moskowitz budget. And it's likely many teachers and students will suffer its after-effects for years to come. Personally, I'm outraged my kids have to sit in a trailer while Moskowitz can just go out and rent the Taj Mahal for hers, if she sees fit.